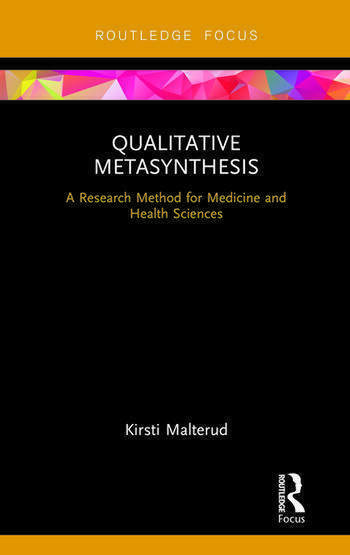 Qualitative Metasynthesis presents a research method developed for upcycling and synthesis of qualitative primary studies, aimed at researchers within medicine and health sciences. This book demonstrates how and why qualitative metasynthesis can be a method for reuse and expansion of medical knowledge. It presents the principles of metasynthesis as a qualitative research method, so that the reader can assess whether this is a research strategy that fits the aim of their study. The author　offers practical advice for conducting research using this methodology. The　presentation　is illustrated by a study carried out by the author and collaborators,　reflecting on real-life challenges and solutions as an example of meta-ethnography, one of the most frequently used strategies for qualitative metasynthesis. The author also looks at systematic reviews, a methodology developed within in the tradition of evidence-based medicine, discussing　strengths, weaknesses and pitfalls of this methodology. Rooted in the interpretative paradigm,　qualitative metasynthesis challenges several of the principles from the evidence-based medicine tradition, offering reflections on challenges when epistemologically very different methodologies intersect. This book should be considered essential reading for anyone carrying out qualitative research within the fields of medicine, health and social care. Kirsti Malterud, MD PhD, was a general practitioner for 35 years, combined with academic work as a professor of general practice at the University of Bergen, Norway. Her list of research publications is extensive, with empirical studies about vulnerable groups of patients as well as methodological contributions on qualitative research methods.